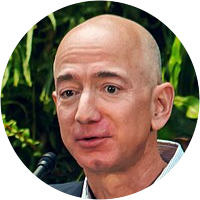 A collection of the best Jeff Bezos quotations. You cannot rest on your laurels in this world. Customers won't have it. You can explain things to people, but you cannot understand things to people. If someone thinks they are being mistreated by us, they won't tell 5 people, they'll tell 5,000. Leaders have relentlessly high standards – many people may think these standards are unreasonably high. The killer app that got the world ready for appliances was the light bulb. So the light bulb is what wired the world. One thing I love about customers is that they are divinely discontent. Their expectations are never static – they go up. It's human nature. Setting the bar high in our approach to hiring has been, and will continue to be, the single most important element of Amazon.com's success. We didn't ascend from our hunter-gatherer days by being satisfied. People have a voracious appetite for a better way, and yesterday's 'wow' quickly becomes today's 'ordinary'. We see our customers as invited guests to a party, and we are the hosts. It's our job every day to make every important aspect of the customer experience a little bit better. The football coach doesn't need to be able to throw, and a film director doesn't need to be able to act. But they both do need to recognize high standards for those things and teach realistic expectations on scope. We first measure ourselves in terms of the metrics most indicative of our market leadership: customer and revenue growth, the degree to which our customers continue to purchase from us on a repeat basis, and the strength of our brand. You can consider yourself a person of high standards in general and still have debilitating blind spots. There can be whole arenas of endeavor where you may not even know that your standards are low or non-existent, and certainly not world class. It's critical to be open to that likelihood. I believe high standards are teachable. In fact, people are pretty good at learning high standards simply through exposure. High standards are contagious. Bring a new person onto a high standards team, and they'll quickly adapt. The opposite is also true. If low standards prevail, those too will quickly spread.